Mirai Live is a cutting-edge online teaching platform where you can learn the skills to design, grow, and understand bonsai like never before. You can interact live with bonsai professional Ryan Neil and artists from around the world to access their secrets to designing and growing robust trees. When you approach a stumbling block in bonsai, you now have a place to get your questions answered. With Mirai Live, you have the tools to maximize every tree you put on your turntable. What makes Mirai Live different from other bonsai videos? With Mirai Live, bonsai knowledge is limitless. You can have direct access to world renowned bonsai professional Ryan Neil and ask him your questions in real time. You can witness the ins-and-outs of Mirai’s approach to bonsai as an intersection of artistry and horticulture. The library is always expanding - you can have unlimited access to re-watch and build your skills at your own pace. Each week, you will have something new to watch, absorb, and incorporate into your own practice. Mirai Live is about you! Our streaming topics are dependent on your feedback. Tell us what you want to know and we’ll teach you on Mirai Live. The biggest definer of this platform is our capacity to connect you to experts who will provide the tools you seek. Do I need previous bonsai experience to use Mirai Live? Mirai Live is designed to accommodate every skill-level in bonsai - from people beginning to appreciate the art, to those mastering their skills, to those innovating in the field. Our video library covers a wide range of knowledge, from fundamental techniques to high-level design theory. We give you the background story behind what has remained elusive in the world of bonsai for centuries. Whether you’ve been practicing bonsai for decades or are simply intrigued by the art form, Mirai Live will reorient the way you experience and practice bonsai. To sign up, simply use the form on the homepage of the website. Once your account is created, you may then choose your plan and billing frequency - we offer annual or monthly rates. We offer a 7-day free trial at both of our membership levels for first-time subscribers. After entering your credit card information, you will need to activate your account. You will not be charged until the 7 days of your free trial have elapsed. A link will be sent to your account email that you will need to follow to fully activate your Mirai Live account. You will also receive an email detailing the success or failure of your payment. If your account remains pending, there may be issues with your billing. Once your account is confirmed and your payment is successful, you will be able to access the Mirai Live content affiliated with your membership level. For questions regarding upgrading your membership, see the ‘Upgrade’ section in this FAQ. When do you stream Live? Tuesdays at 6PM PST, unless otherwise specified by the Mirai Team. When we are Live, the Mirai logo in the top left-hand corner will be red. Click on it and, if you are a member, you will be taken to the page where the live stream plays. If you are a member, we will send you weekly emails reminding you to join us Live! Can I re-watch the streams? Are they available for download? Yes! You can re-watch edited versions of the streams to build your skills. They are stored in the Mirai Live library, accessible by clicking ‘Library’ at the top of the page. You will have unlimited access to replay these videos when connected to wi-fi or a cellular data network. Mirai Live videos are not available for download to your device. How frequently are videos uploaded? You can watch new videos every Thursday. As a Standard member, you will have access to past live streams, species & technique features, and extended-cut videos. As a Pro member, you will have unlimited access to the entire Library in addition to archived Q+As, weekly design critiques, and other Pro-exclusive content. Can I access Mirai Live on mobile? Yes! You can tune into Mirai Live in HD on most smartphones and tablets (iOS 10 or newer, Android 7 or newer, and Windows Phone 8.1 or newer). On desktop computers (Macs and PCs) Mirai Live is designed to work on all major and modern web browsers (Chrome, Safari, Firefox, Internet Explorer 11 and above). How do Q+As work? How do I find them in the archive? As a Pro member, you will be notified ahead of time when Live Q+As and Forum Q+As are scheduled via email. Both types of Q+A will happen approximately once per week. During Live Q+A’s, you will be able to interact with Ryan Neil and the Mirai Team via the chat function. In Forum Q+As, you will post questions in a designated forum thread in advance, and the first 20 questions in the thread will be answered (one per person). The thread will be open for 48 hours each week. The point of these Q+As is to dive deep into the nitty-gritty of bonsai. Any question is fair game, and we go line-for-line each question that is asked for exactly 1 hour. We do our best to answer as many questions as possible, but we can’t always get to everyone. To be fair, we don’t take questions for the Live Q+As ahead of time. This way, we can answer as many questions as possible from folks who join us live. If you already have a Standard subscription to Mirai Live and you are ready to elevate your bonsai education to the next level, you can upgrade to a Pro subscription by visiting the My Account page. Scroll down to ‘Billing’ and click the ‘Change Plan’ button. How do I access the Mirai Live video library? As a Mirai Live member at either level, you can build your skills with Mirai Live’s video library by clicking on the Library link in the top navigation bar of the site. We are uploading video content every week, so there is always something new for you to watch! How do I access the extended-cut videos and features? Both Standard and Pro members can watch extended-cut videos and species/technique features. Extended-cut videos will appear on the individual lesson page to which they relate, and species/technique features can be found in the Library. You can use the Library filtration system to find this content as well–click on “content type” and then click the type of content you wish to access. Pro members will be able to access Pro-exclusive content–Q+As, design critiques, and more–by using the filtration system to select “Q+A” and other Pro content types in the “content type” filter. We are continually uploading premium video content outside of our live streams, so check back! You will be able to tell content is new by the red marker on the thumbnail. Will I be able to communicate with Ryan Neil directly? You can talk with Ryan directly as a Pro member via the chat function during live streams and Pro-exclusive Live Q+As. You can chat with us during live streams and Live Q+As if you have a Pro membership on Mirai Live. When we are Live, the chat function will appear to the right of the streaming video once you’ve clicked on the stream from your homepage. You may enter your name or stay anonymous as a ‘guest.’ You will see the names and comments of other Mirai Live Pro members. You can enter your questions/comments in the space offered, and the Mirai Team will be standing by to acknowledge your feedback live! How are my questions answered on the chat? When we are live, as a Pro member you can ask questions/provide feedback by typing in the chat window to the right of the live stream viewer. The Mirai team will incorporate relevant questions/comments into the live stream by asking Ryan out loud. We will filter out questions that are off-topic to the stream and/or about a very specific situation. The Live Q+As are Pro members’ opportunity to ask species-specific questions, or tree-specific situations. Some of your questions will be answered by the Mirai Team directly through the chat, as written responses. You will see Mirai Team members (denoted by a star next to their chat username) as users on the chat, interacting with you live. Your questions really dictate the direction of Mirai Live discussions. Oftentimes, Ryan will ask you all for design feedback, or to answer horticultural questions. As a Pro member, you can collaborate with Ryan Neil live. If your question wasn’t answered on the stream, don’t worry–we save all leftover questions and bring them to the next Pro-exclusive Live Q+A. My account is ‘pending activation.’ What does this mean? You won’t be able to join us Live until you activate your account! You can do this by opening the ‘Welcome to Mirai Live’ email sent by Bonsai Mirai and clicking through the activation link. Check your trash or spam folders. If the email is not showing up in your inbox, or if the link isn’t working, let the Mirai Team know via the Contact page or by emailing support@bonsaimirai.com. I am having issues during the live stream. What do I do? If there is a technical problem occurring with the stream on our side, we do our best to communicate with everyone watching that we are working to solve the issue. However, if you are experiencing interruptions, buffering, or a lag and it does not seem to be due to technical​ issues on our side, you can troubleshoot with these steps. #1 - Refresh your page. This is a simple way to fix many stalls, freezes, or buffering issues. #2 - When we are Live, we receive the fewest reports of issues with Google Chrome. If you are using another web browser, sometimes issues can be solved by simply switching. #3 - Take your streaming quality down to 720 or 480p by clicking the gear icon on the bottom right hand corner of the video. A series of numbers will pop up and you can lower the video quality. #4 - You may need to check your internet speed by performing an internet speed test. Go to www.speedtest.net and run the speed test to see how many megabytes per second your internet is capable of handling. If you are currently watching the livestream, you will need to close that tab to get accurate speed test results. When we are streaming Live, we send out around 12mbps in data, which is a very big signal - this is the nature of live video broadcasting. We suggest that users have, at the bare minimum, internet speeds of 15-20mbps. Users also need to keep in mind that any other devices in your household connected to the internet maybe hogging data - if someone is playing video games, watching Netflix in another room, or if your phone is downloading something, etc. If your internet speed is below 15-20mbps, or if you pay for internet that should operate at speeds above this and you are still experiencing problems with speed, you will need to call your internet provider to address your needs with them. If you’re still having problems while watching our live stream, please go to https://browser.bonsaimirai.com while the problem is occurring and copy the URL at the top of the page into an email to support@bonsaimirai.com. This will aid us in troubleshooting. I’m having issues watching videos in the Library. What can I do? We’ve heard from some of you that watching the archive videos has been interrupted by long buffering times and/or a blank screen. While it is common for online video to occasionally require a page refresh or extended load time, it is not common for this to totally interrupt your experience again and again. We heard you, we did some digging, and this is what we’ve found. Try switching your web browser. Web browsers are constantly updating, this can cause unknown configuration issues with the different platforms we use. Simply switching your web browser to see if this problem is unanimous across web browsers is a good first step for troubleshooting. When you reach out to us about an issue and you’ve experienced it across multiple browsing environments, this gives the Mirai Team a better understanding of how to recreate the problem. As you browse the web, your computer collects tiny files from websites to improve your experience when you revisit that page. Sometimes, these files can create conflicts or hang-ups in your web browser resulting in any number of problems. Follow the links below to learn how to clear the cache of some of today’s most popular browsers. Please note that clearing your cache may result in the loss of any saved passwords so you’ll have to reenter them after clearing your cache. Also, websites you frequent may initially load slower upon your first visit but trust us, a clean browser cache makes your computer very happy. Your operating system on any device you connect to the web – iPhone, iPad, laptop, desktop—requires maintenance. Making sure your computer is running on the latest operating system, or OS, can really improve your experience when using current web-based technology. On top of running on the latest OS, the apps and web browsers you use to connect to Mirai Live should be updated to the latest version. This is a simple step that can clear up bugs. If you still experience trouble and are running on the most up-to-date technology, that helps the Mirai Team pinpoint problems beyond out-of-date browser and app issues. As the web grows and evolves, it demands more and more computing power to drive the technologies that make it such a wonderful place. Hardware acceleration is a setting that allows your web browser to leverage your computers graphic processing unit to improve your browsing experience. Please follow the instructions below to access the hardware acceleration settings for some of today’s most popular web browsers. 1. 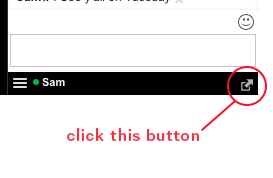 Click “Customize and Control Google Chrome” (three dots in the top-right corner) and choose settings. 2. Choose “Show Advanced Settings” at the bottom. 2. Click the Tools icon in the upper-right corner, and then click Internet Options. 3. Click the Advanced tab, and then under Accelerated graphics, select the Use software rendering instead of GPU rendering check box. 4. Click “Apply” and restart your computer. If you’re still having problems, please go to https://player.vimeo.com/debug and copy the URL from the green box into an email to support@bonsaimirai.com with a description of your problem so we can troubleshoot individually. If you are still having technical issues, if your questions weren’t answered in this FAQ, or if you have some feedback to share, let us know! Tell us via the Contact page or by emailing support@bonsaimirai.com. Thanks for being a part of Mirai Live!